I won't be showing you the weekly chart as I have shown you it in the last analysis. If you scroll down you will realize that the 1.75 area is a serious resistance area that needed to have its supply being absorbed. The recent move up may have help to absorb some of the supply. A bullish cross also happened in the daily chart. What you need to do is to pay attention to the daily box I have drawn. Boxes are reference points of whether the bulls or bears are taking over a stock. If Inari can trade above this recent box, then it is likely to continue to move higher. The bulls are winning and that is good for the stock. On the other hand, if Inari drops below the box, then it signals that the bears are winning. Therefore, you can expect lower prices for the stock. Again with so many Malaysian stocks Inari is one of those that I have not commented for about a year. I think it's time to revisit this stock and see what is the technical picture of this stock. One can certainly learn a lot just by studying the charts of these stocks. Not only do you learn from the past, you can often see what might happen in the future by looking at the past and what is happening currently. I did have some problems when bringing up the chart from Investing.com. I think the dividends might have done something funny to the stock chart. So instead of investing.com today I will use tradingview.com's chart as they reflect the price chart properly. First of all, let us have a look at the daily chart of this stock. 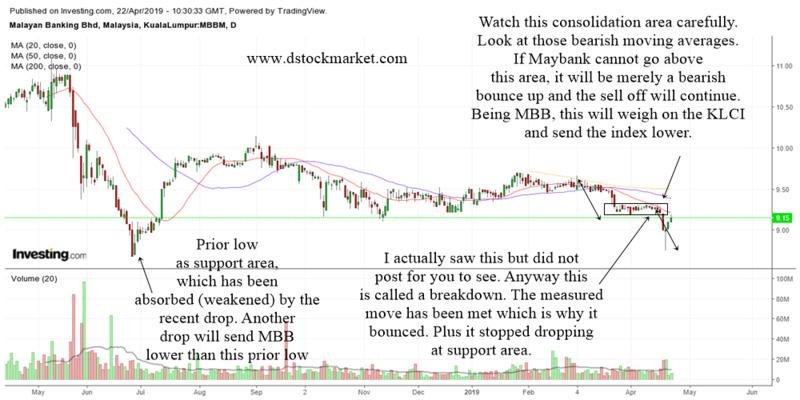 Along with the US market and so many other Malaysian stocks, this stock has bottomed and is now in a confirmed new daily uptrend. It recently broke a downtrend line and at the same time broke above a daily ascending triangle. It might be a bit hard to see the ascending triangle but the people who bought and help create the large green candle as it shot up certainly had some inkling that it was going higher. 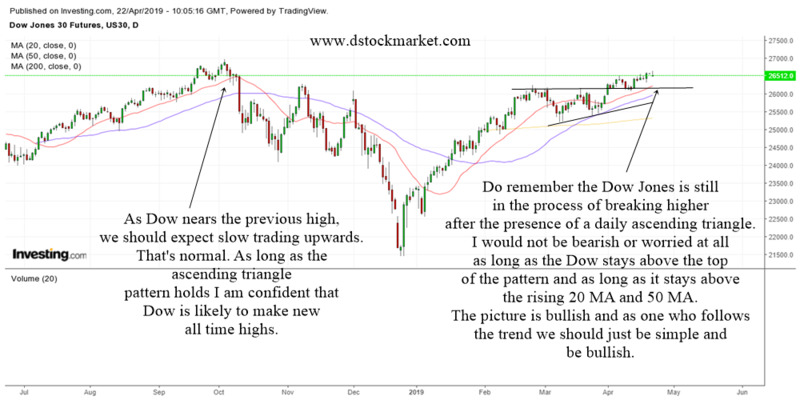 When stocks break above a downtrend line as well as a chart pattern such as the ascending triangle, it is a buy setup. Simple yet powerful. If we take the height of the ascending triangle, the current short term move up target has already been met. So, those who are smart traders have already entered and I think one would need to find another buy setup in this new uptrend to enter. Perhaps when it dips a bit or trade sideways and form a breakout later. Notice how the stock is still below the daily 200 day moving average. Thus this stock is not of investing quality but one can still learn to trade it. It is about to make a daily bullish cross and this can usually mean that it wants to go higher in the future. The daily uptrend might encounter some resistance when we look at the weekly chart. That's because the previous lows now act as a resistance. It does not mean that the stock will come collapsing down. It just means that traders should learn to take profits a bit faster. 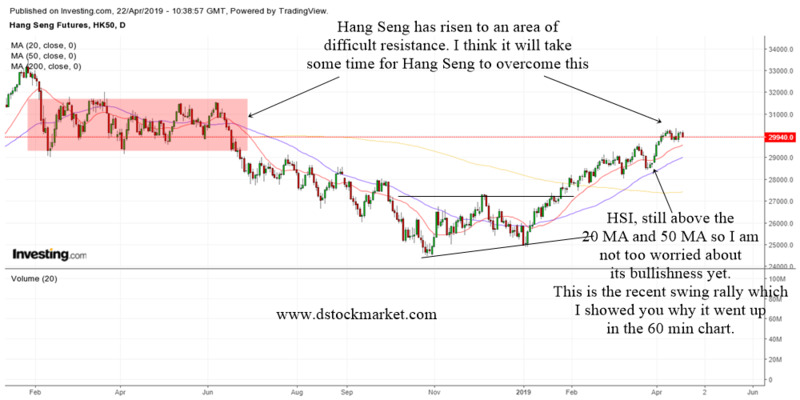 If the stock can trade sideways a bit, it will certainly absorb the supply from the resistance and then setup another buy setup for traders to enter. For those who study charts, the weekly chart above is a classic case study of a weekly double top. With a topping tail at the right mountain, it certainly did tell investors or traders who are observant that it is time to sell the stock. And just when you think the stock will go lower to zero, the stock formed a weekly bullish harami at the weekly 200 MA. Along with the bottoming tail, it was a signal for traders to buy the stock for an oversold bounce up trade. 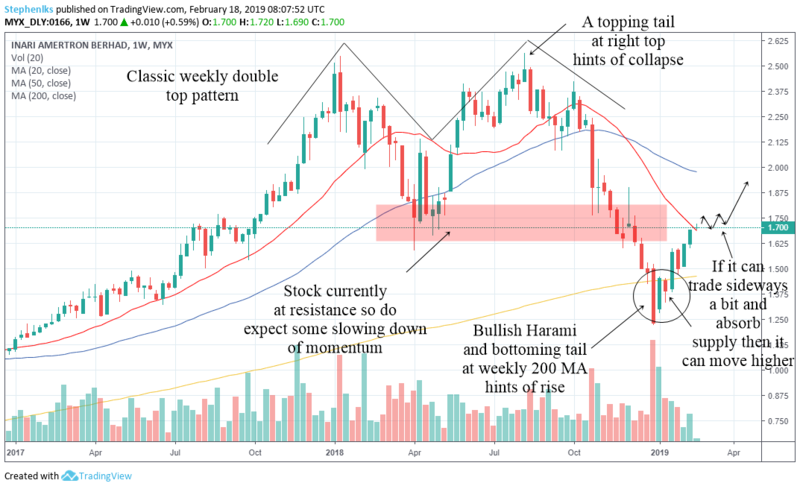 There is tremendous value in studying Japanese Candlesticks and especially so if the pattern appears in the weekly charts. That is how you can catch the tops and the bottoms. The chart above shows the monthly chart of Inari. Well it has certainly suffered a big drop. But price support did help to keep it up. A monthly bottoming tail has formed and this is a big hint that the stock wants to go higher. How high it will go I do not know. But the presence of this bottoming tail does tell us that we should look for bullish setups in the daily chart. And that is where the trading strategies in your arsenal will help you to spot the opportunity when it comes. For long term investors, if Inari does not drop below 1.25, which is where the end of the bottoming tail is, then your investment is still intact. After rising by more than 100% since 2017, will Inari Amertron's share price continue to rise? Or will it disappoint investors in 2018? Inari's market cap has risen by a few billion to 6.93B thanks to its rising share price in 2017. It is also one of the largest tech companies by market cap in Malaysia today. This stock has been a blessing to many. From long term investors to short term traders, Inari has been able to offer many profitable opportunities. It has been some time since I look at Inari. Since I am unable to write about it everyday, let me show you the weekly chart which is the long term view of the stock and then the daily chart. 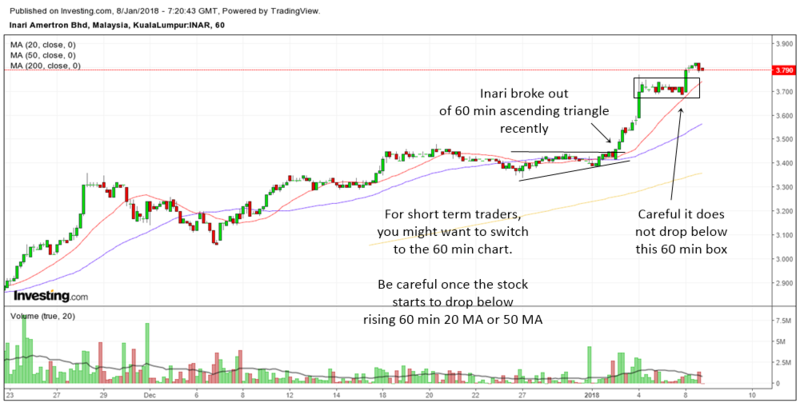 Sometimes it's beneficial to look at the 60 min chart and the 15 min chart but often times things happen too fast for the average investor to take action and by the time you look at it things might have changed. So, perhaps from now on I should study more about the weekly chart and the daily chart of Malaysian stocks. For the S&P and Dow, its alright to look at intraday charts as I analyze them every day. The chart above is the weekly chart of Inari. The stock has suffered quite a big drop since it topped out in early 2018. I think this has caused quite a lot of losses and shrinkage in profits for many investors. This is not an isolated event as when you look at most stocks around the world, they kind of reflect the price movement of the Dow Jones. So what happens in US does not stay in US. Which is why its important for the Malaysian investor to be on the lookout for the S&P and Dow each day to have a big picture view of what might happen to their individual holdings in the local stock market. Inari is currently hovering at an important support area. This is where in the past there was a weekly ascending triangle breakout. The top of the pattern can act as a support area when the stock falls back down. As you can see, Inari dropped to the area and quickly climbed back up to form some kind of bottoming tail candlestick pattern last week. If Inari is able to stay above this support area, then it is likely that it may bounce up in the future. If Inari falls below this support area then there might be more selling down in the future. With the big picture in our mind, let us now move on to look at the daily chart of Inari. I have colored the support area in green for your convenience. Before that, there were many signs that this stock was about to correct. It dropped below the daily 50 MA then it formed a descending triangle and it also slashed through the 200 MA. It is usually not a very good sign to see your stock trade below the 20 MA and 50 MA. Each drop below each MA is another warning sign that the stock is not acting well. On the other hand, if the stock can climb back above its 20 MA and subsequently the 50 MA, then the stock may once again be healthy again. At this moment, what you want to see is for the support to hold. Then you want to see the stock trade back above its 20 MA which is the red line on the chart. 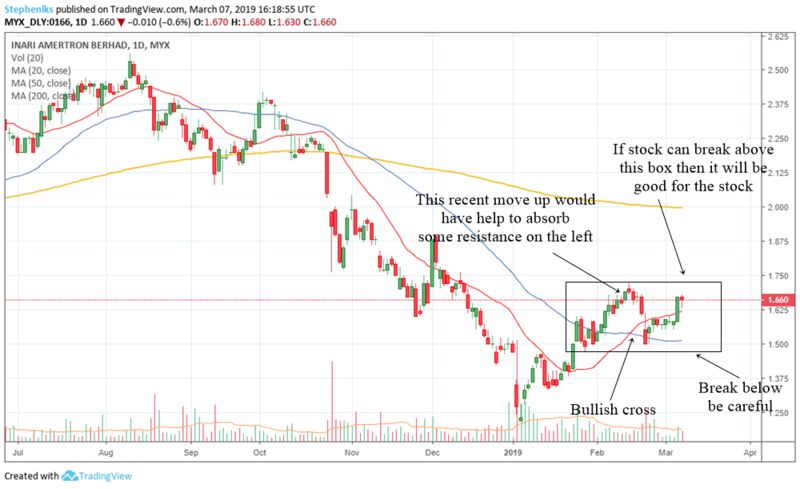 Next, a trade back above the downtrend line I have drawn may eventually help the stock to bottom out and perhaps start a new stage 2 uptrend in the daily chart. 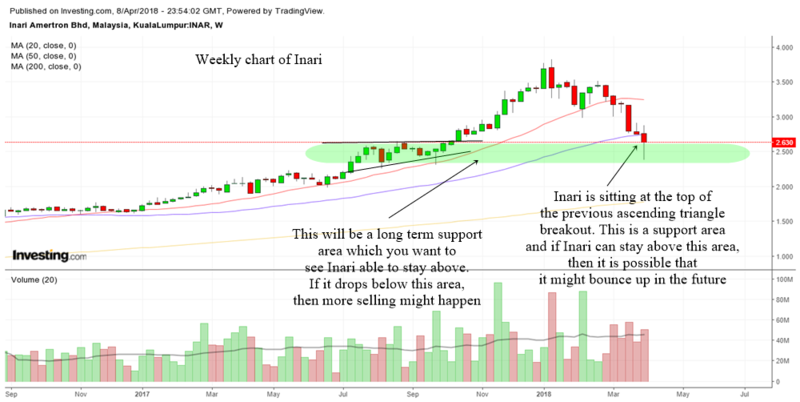 As an update to today's analysis, I would like to show you the weekly chart of Inari. Someone told me that Inari is affected by Apple's performance because of Broadcom outsourcing some stuff to Inari, so psychologically Inari's performance will be affected by Apple. Recently Apple hit its 200 MA and bounced up nicely and Inari also bounced up nicely like Apple. 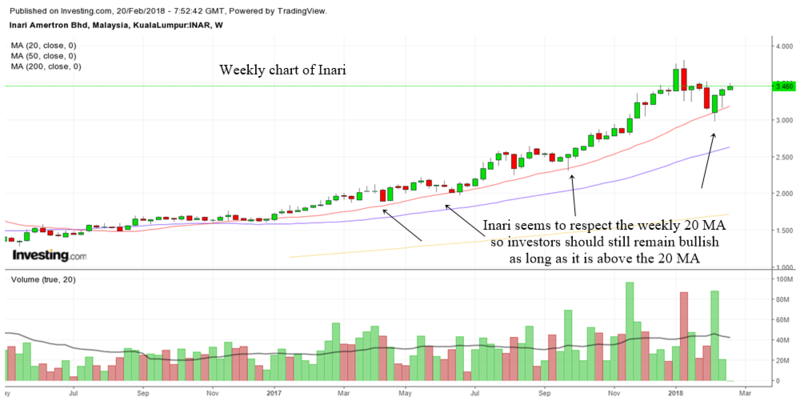 In order to look at the big picture concerning Inari, we need to look at the weekly chart of this stock. What you will see is this stock is still in a nice weekly uptrend. You will also observe that Inari respects the rising 20 MA. Every time it drops to the 20 MA, it bounces up. So from now on you might want to pay attention to the rising weekly 20 MA. As long as Inari stays above this MA you want to be bullish on Inari long term. When the weekly trend is up, the only thing you should be thinking is whether you should buy the dips. Well as they say, stay with the trend till it changes. So far there is no change in trend in the weekly charts. Much has happened with Inari as well since the last time I had a look at it. There are a few technical developments that I do not like about Inari at the moment. First of all, it broke below an uptrend line which is a sign of weakness. Secondly, it broke below the 50 MA which is widely followed by many investors. The support area at 3.00 will be very crucial for this stock. Today, it formed a bottoming tail. At the first hour of trading, you can also see an hourly bottoming tail. Bottoming tails at support can provide trading opportunities. But perhaps they only last for 1-3 days. 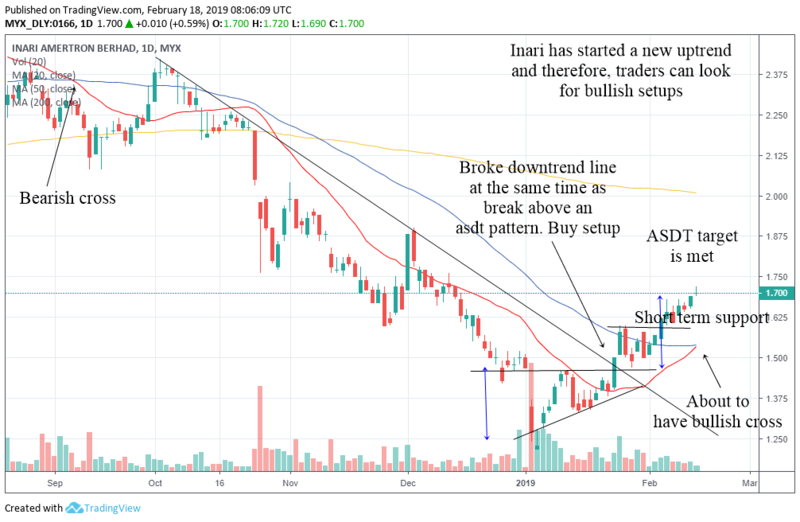 Recently, someone asked me if she should invest in Inari, I said I don't like the construction of the charts and would prefer to trade the stock. You see, investing only needs 2-3 major decision in a stock each year. That is investing where you put in lots of money into the stock 2-3 times a year. The latest good investment setup was the ascending triangle back in October 2017. However, for traders this stock can perhaps give 1 or 2 trades a week. Needless to say, day traders and scalpers will have more trades as their holding period is very very short. Perhaps you might want to use Investing.com's technical summary to aid you in some market timing for the stock. I have written an article recently that teaches you how to utilize this stool. As you can see, Inari is in a mid term and short term weakness in long term strength. So one should be cautious in this stock. Traders who do guerilla trading will always be able to go in and out fast but short term traders who want to ride the short term trend, you still have a strong sell signal in the hourly charts. The chart above is the daily chart of Inari. In my earlier analysis, I have shown you how Inari had shot up once it broke above an ascending triangle. I also showed you how the stock shot higher in early January 2018 after it formed a consolidation at support breakout pattern. After that, the stock corrected along with the entire Malaysian tech sector. Corrections are to be expected as no stock will ever go up non stop. 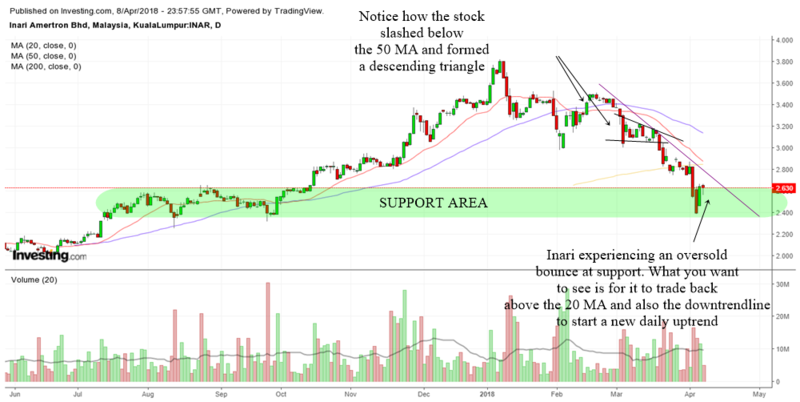 At this moment, Inari's share price is trading slightly above an important support area. The old highs which I have drawn with a "V" shape once overcome became a new support area. You can see how the stock corrected to the area and stopped dropping. The stock is also near its rising 50 day moving average which is often a very powerful psychological support. Great performers in the stock market often stay above its rising 50 MA most of the time. Therefore, it will be important for Inari to stay above the rising 50 MA which coincides with price support area. So, as long as Inari can stay above this important area, there is a bullish bias in the stock. If you look at the daily chart of Inari, you will notice that it has been making higher highs and higher lows. This is the characteristics of a healthy stock. So far, it is still following this script. If Inari starts to make a lower high, we can expect a slowing bullish momentum and trend change. Longer term and mid term investors can use the 50 MA and 200 MA as a rough guide. This might sound simple. But I have seen it work so many times that it amazes me how simple is best. Let's move on now to a short term view of this stock. The chart above is the 60 min chart of Inari Amertron. The 60 min chart is often used by short term traders. It can also be used by investors to get a feel of the short term movement of a stock. I did highlight in my past analysis of Inari that if it breaks below the box I have drawn and breaks below the 20 MA, you have to be very cautious. The reason is Inari has been moving up quite a lot. The failure to breakout higher above the box brought the stock crashing lower very quickly. This also coincided with the correction in the tech sector. One great thing about using the 60 min chart is if you have sharp eyes, you can often spot nice trading opportunities. I have drawn 2 ascending triangle breakout in the chart above. The first one happened before the correction and the second one just happened yesterday. 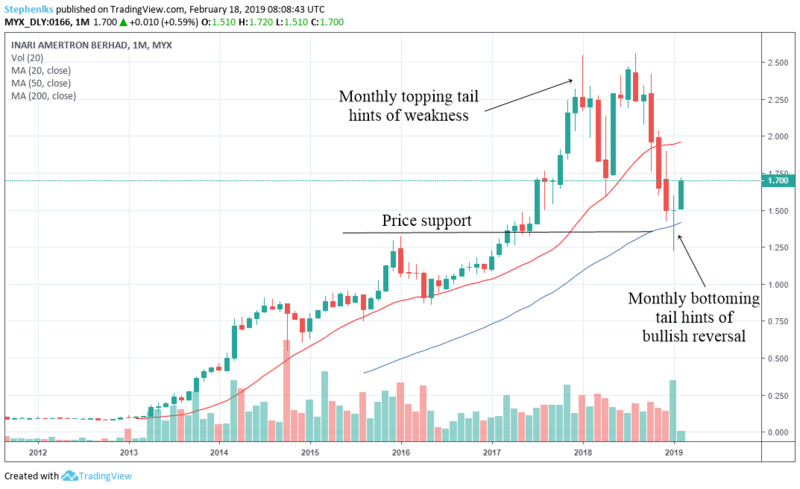 If you have read my recent analysis on the Malaysian stock market, you will realize that I have pointed out that the Malaysian tech sector is reaching an area of support. That is a time to begin finding some bottoming trades in tech related stocks. The breakout of the recent ascending triangle has met its initial target. If Inari can continue to make higher highs and higher lows in the 60 min chart, it might just go up higher next week. Perhaps the nice bullish cross in the moving averages will help as well. The above is the daily chart of the Malaysian tech sector which Inari is a part of. Can you see that it is correcting to a strong area of support? It is also sitting at the rising 50 MA. Usually when a sector hits an area of support, it can give traders a lot of trading opportunities in the short term in individual stocks of the sector. Moving on to a bigger picture, the Malaysian tech sector is actually in a very nice daily uptrend. I believe that as long as the tech sector stays above the support area I have drawn, it will continue to go up. This will be very beneficial to many Malaysian tech stocks. Finally, let us zoom out to an even bigger picture and look at the weekly chart of Inari Amertron. Weekly charts are more for long term investors and fund managers. As you will be moving a huge amount of money in and out of the stock, it does not make sense to day trade or swing trade the stock. 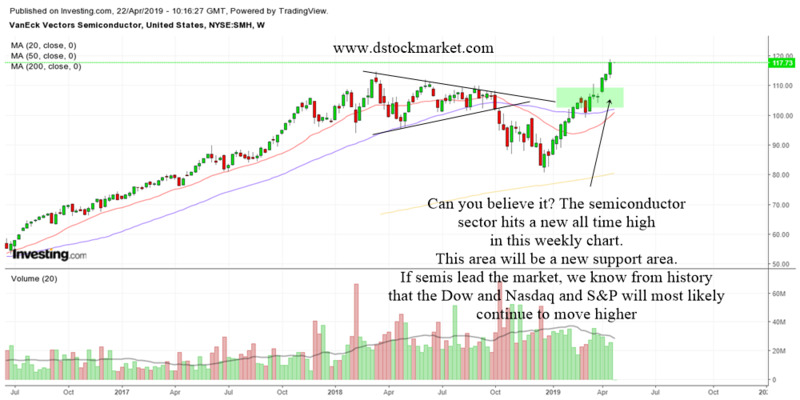 Therefore, the weekly chart can offer a lot of clue on the health of a stock from a long term perspective. As you can see, the weekly chart is in a very nice strong uptrend. I do not see any weakness at the moment with regards to the long term picture. Again, I must say it is a very simple trend following method. But it has worked out very well for this stock. By the way, here's another bonus I would like to share with you. Notice how Inari has closed this week's trading by forming a bottoming tail? In the past two times when it formed a bottoming tail, the stock has shot up higher next week. If history repeats itself, it is very likely that Inari may go up again next week. Short term traders might want to keep that in mind. Another hot rising stock in Bursa, Inari Amertron had a nice bull run. Recently it broke out of 2 ascending triangles, which you can see on the chart. 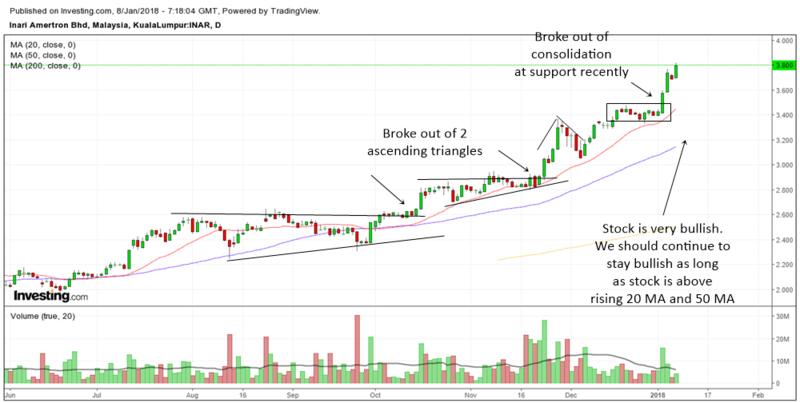 In early January 2018, the stock broke out of a consolidation at support pattern. 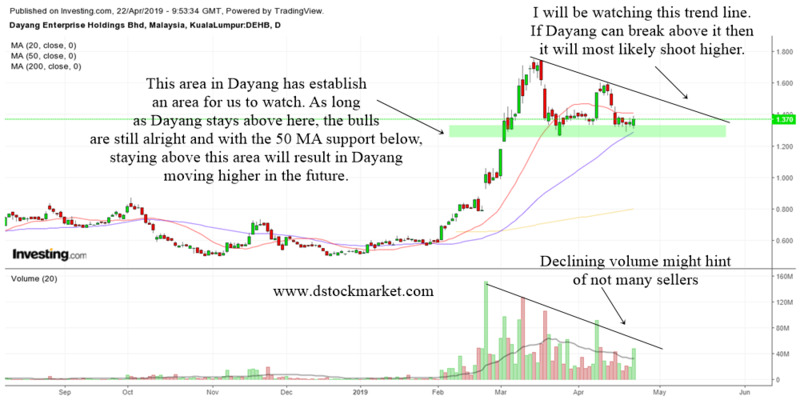 This stock is extremely bullish and since it is in an uptrend, we should continue to stay bullish as long as the stock is above the rising 20 MA and 50 MA. Shorter term traders might want to look at the 60 min chart of Inari Amertron. Sometimes you can find lots of trading opportunities by zooming into the lower time frames. As you can see from the chart above, the stock recently formed a 60 min ascending triangle and shot higher. I like to use the 60 min 20 MA and 50 MA to gauge the trend strength of a stock. Since Inari is still staying above the 60 min 20 MA, I will continue to be bullish on it short term. If the stock drops below the 60 min 20 MA, you have to be a bit careful of it. The daily chart is in a strong uptrend. So, any corrections or dips can be bought. Sometimes you can use the 60 min chart to find trading opportunities. You might even find 1 or 2 hourly ascending triangles to trade!